Garlic Ginger Shrimp Stir Fry - Gutom Na! Posted on Monday, December 28th, 2015 at 2:05 am. In a wok or large saute pan over high heat, add half the cooking oil and swirl to coat the bottom of the pan. 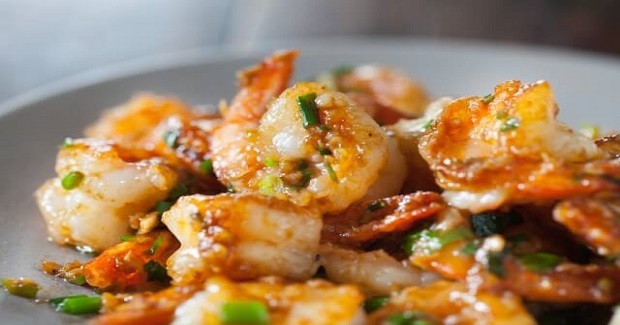 When the wok is very hot, add the shrimp in a single layer and cook partially until one side is seared brown, about 1 minute. Flip and sear the other side of each shrimp, about one more minute. They don’t need to be cooked all the way through yet. Remove them to a plate or bowl and set aside. Turn the heat down to medium and let wok cool off a bit to prevent the aromatics from burning. Add the remaining cooking oil and add green onion, garlic and ginger and stir fry for a minute until fragrant. Pour in the sauce mixture and add the shrimp back into the pan. Stir fry for another minute until shrimp is cooked through. Serve immediately.